Pakistan’s defense ministry announced another test flight on May 31 of the locally developed air launched cruise missile (ALCM). The Hatf-VIII, also known as Ra’ad (Thunder), is a “low-altitude, terrain-hugging missile with high maneuverability” and a range of 350 km (217 miles), according to the ministry. It can accurately deliver conventional or nuclear warheads, the ministry added. The launch aircraft was not identified, but three previous launches since 2007 have been reported from Mirage III fighters. 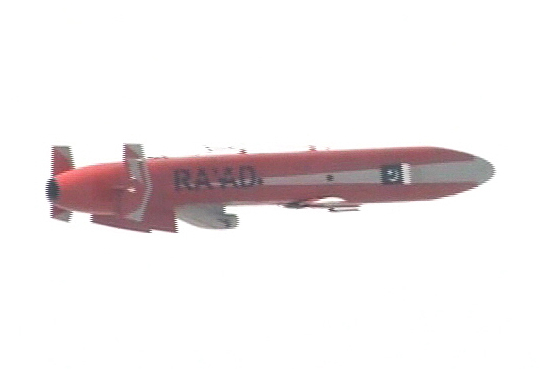 Along with the ground-launched Hatf-VII Babur cruise missile, the Ra’ad was developed by Pakistan’s Air Weapons Complex and the National Engineering and Scientific Commission. According to Jane’s Air-Launched Weapons, engineers from Denel of South Africa may have assisted in the design. The ground-launched missile was also test-fired again this week. The ministry said that the latest test of the Ra’ad included a command and control system that provided real-time remote monitoring of the missile flight path. The statement added that only a few countries have developed such ALCMs. Last August, Turkey’s state-owned defense research and development organization conducted the first flight of its own indigenous cruise missile.